Enjoy the new massage chair! 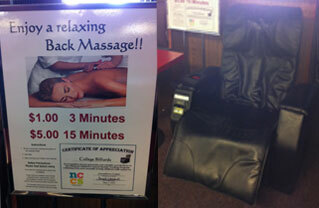 Take a break from a long session of pool and enjoy a relaxing back massage! While more research is needed to confirm the benefits of massage, some studies have found massage helpful for stress relief, stiffness, blood pressure control, improved circulation, and boosting immunity. People often report a sense of perspective and clarity after receiving a massage. The psychological balance a massage brings can often be just as valuable as the more tangible physical benefits. We all know the importance a clear mind plays in the games of billiards! In 2007 College Billiards local Victor Castro was featured in a reader article “The Best Players in the World: Filipinos and Pool”. Check it out!